Welcome to the Ezy Homes Australia official Blog site. We are Australia's steel pole home specialists. Available as DIY kit homes or built for you. Here we will post news of projects under development, company news, construction tips, and home design ideas. From this blog, you can also link to blog's by owners of Ezy Homes - and learn about their personal experience as their dream home is constructed. Following recent comments from people contacting our office, we see there is a need to clarify that Eazy Homes (in WA) is not us - the original Ezy Homes Australia. After spending 12 years building the Ezy Homes brand, it is quite surprising that ASIC approved the use of Eazy Homes as a business name - with both companies in the same business market. 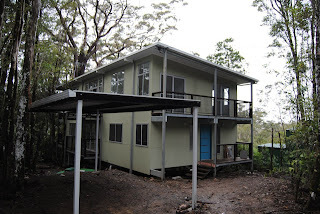 US - Ezy Homes Australia, since 2000, Brisbane National HQ, our own in-house developed steel pole home construction system, have supplied 100's of homes all over Australia & to PNG. THEM - Eazy Homes Australia (formerly Sharp Carpentry), since 2007, Perth based, another kit home company doing the same thing everyone else is doing. Fortunately Eazy Homes only have a similar name to us - not a similar service standard. Here is a recent comment from a WA client, "Thank you for being so helpful and patient. Our dealing with 'Eazyhomes' here in WA have not been half as helpful as you." We have received the following pics from our client at Cradle Mountain, Tasmania. 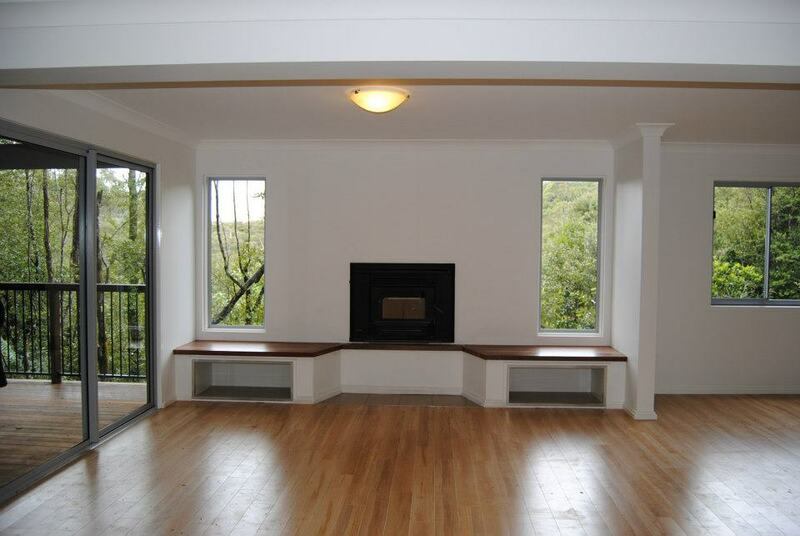 This home was built by our local builder partner, ET Constructions - and they did a fantastic job. Ezy Homes designed & supplied the structural steel frame. Our frame kits are available as kit homes, or as is the case with this project, the frame can be supplied to a builder as part of a completion contract. 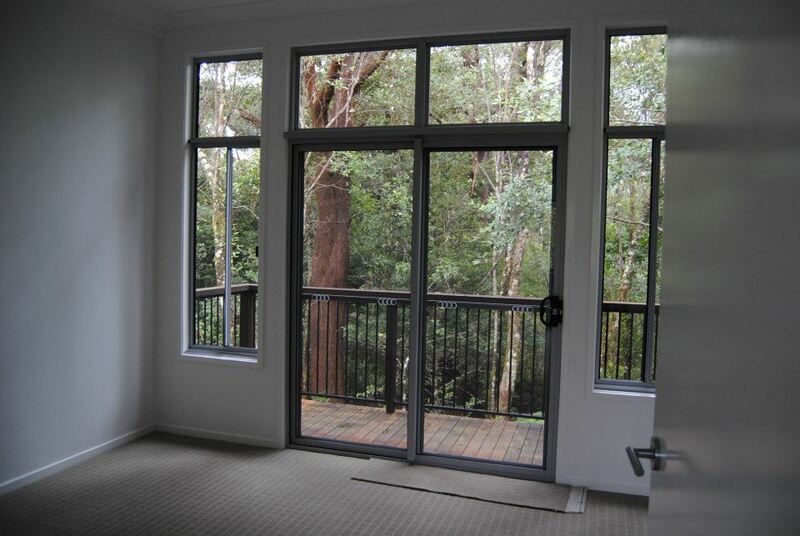 We have just received pics from our client at Springbrook, who built a lovely mountain retreat in the Gold Coast hinterland. Our first home to be built in W.A. has been council approved - so construction will be starting shortly. This project is a custom "Coolum 1" design being built at Mullaloo Beach (north Perth). This particular site has sandy soil, which made a steel pole home the obvious choice. Ezy Homes are suitable for all soil types from sand to solid rock. The builder for this Mullaloo Beach project, Adroit Constructions, is available to build Ezy Homes all over W.A. Ezy Homes takes care of the design, drafting, engineering, fabrication & supply of the structural steel frame. We are using this first project to establish production & supply from Perth, to minimise delivery costs for this home - as well as for our other W.A. clients. We are currently talking to/are drafting plans for clients in Perth, Bunbury, Esperance & Kalbarri. 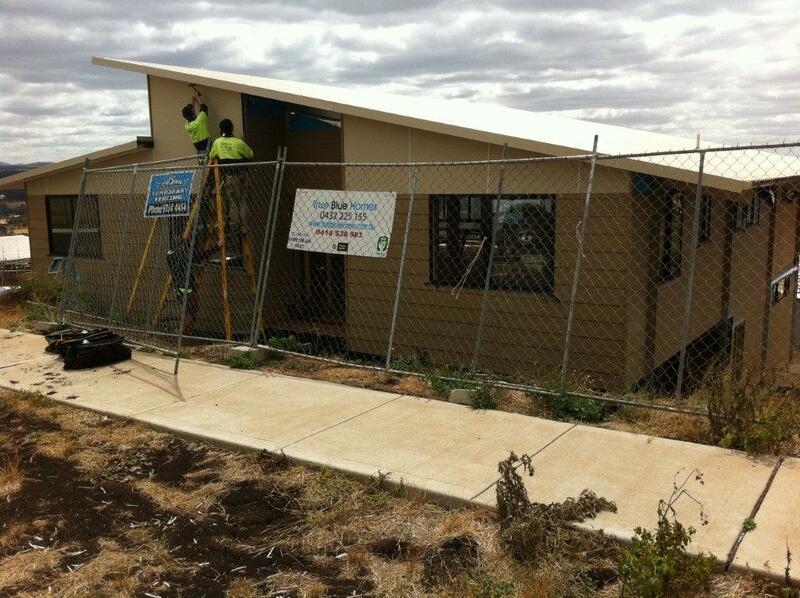 Talk to Ezy Homes about your Western Australia new home project. Our owner/builder client at Mt Crosby has been keeping us up to date with progress of his new home construction. We previously posted lock-up pics - reached after 4 weeks. Now after 8 weeks, the external cladding is complete, plumbing & electrical rough-ins have been completed, and internal walls have been plastered. 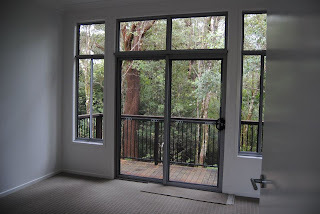 Here are a few pics we recently received from one of our Owner/Builder clients, building a custom "Outlook" at Mt Crosby. With the help of a couple of local carpenters, this house has reached lock-up stage in 4 weeks. The Ezy Home being built in Melbourne, by local building partner True Blue Homes, is nearing lock-up stage. Below are a few pics of the progress so far. 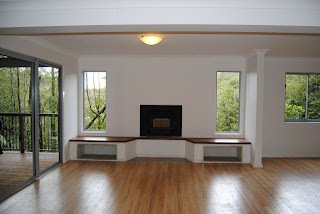 The "Outlook" is one of our most popular designs - with it's high ceilings, clerestory windows, and large decks. Talk to Ezy Homes today about customising this design to suit your needs. Our local builder partner, True Blue Homes, are available to build your new home in the greater Melbourne area. We have been supplying and erecting steel pole homes since 2000. 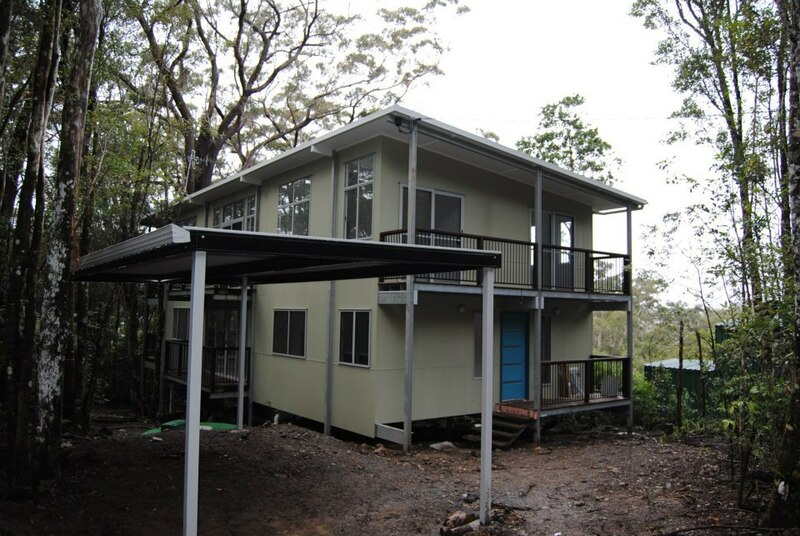 Ezy Homes specialise in the design and supply of steel pole homes, that suit a wide range of building sites - steep, remote, difficult, oceanside are our specialty. The steel frame is pre-engineered, factory cut and drilled - to suit each individual project. We pride ourselves on the quality of our homes and our use of Australian components. We apply the ingenuity of building techniques used in commercial construction to create an open plan living with endless possibilities - ready for you to add your personal touch.